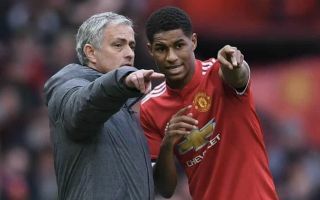 Former Manchester United defender Rio Ferdinand believes that Marcus Rashford is suffering a crisis of confidence under Jose Mourinho’s stewardship. When Romelu Lukaku arrived at Old Trafford in 2017 from Everton, everything changed for Rashford after bursting onto the Premier League scene with the Red Devils in 2015. The 20-year-old quickly became a fan favourite under Louis Van Gaal and held his own as a vital part of the squad during Mourinho’s first year in Manchester too, picking up League Cup, Europa League and FA Cup winners medals along the way. However, Lukaku was instantly employed as the club’s number one striker last season and occupied that spot until the end of the year, impressing pundits and supporters alike with his physicality and ability as a poacher in the final third of the pitch. As a result of the Belgian’s success and the January signing of Alexis Sanchez, Rashford has found playing time hard to come by and on the rare occasions he does feature, he is forced to play out wide in a more unnatural position. That trend has continued into the 2018-19 campaign as the England international – who scored two goals for his country during the international break, including the match-winning goal against Switzerland – has been reduced to just one starting berth in the opening five games of the new season. According to the Mirror, Man United legend Ferdinand, who now works as a pundit for BT Sport, believes Rashford’s development is stalling because of his relationship with Mourinho, as he told reporters: “You can bring me all the minutes in the world, I don’t care. I don’t want to come on for 10 minutes every game. I want to walk out on that pitch as the starter. That is when you know — when you go out there to win every game. “I remember watching Rashford at Celta Vigo in the Europa League. He was like Roy of the Rovers, 19 years old, taking free-kicks and corners and the lot. That is what I loved about him when he first came in. “If you talk about all the best players that come through – Michael Owen, Fabregas, Lampard, Gerrard, Kylian Mbappe now, Rooney – those players played every game, straight away. “They start every game which then breeds confidence. That is when you know. When you go out there to win every game. Rashford’s next opportunity to impress could come on Wednesday night, as Mourinho’s men take on Young Boys in Switzerland in the opening game of their new Champions League campaign.